Rethinking Faith and Church: Pope Recommends Atheism? "If that person is a Catholic, it is better to be an atheist." So the Pope was in the news again this week, ruffling the feathers of the pseudo-Catholics; you know, those who profess to be Catholic in name only, but in lifestyle are anything but. What was it that he called them? Oh, yeah, "hypocrites." Ouch! He then went on to essentially suggest that such people ought to consider choosing atheism as opposed to living a double life. Religious atheists? Hmm. I would like to suggest that before we jump on the bandwagon and slam all the hypocritical Catholics out there, maybe we should also stop to reflect on all the hypocritical Evangelicals out there. Or maybe better yet, we should stop and reflect on hypocrisy in the church as a whole. How many of us lead double lives? We say we believe one thing, but if the truth be known, our lives sometimes tell a very different story. I remember a brother sharing about working with people sometimes for a few years before even discovering that they were also Christians. How is that even possible? Oh, the missed opportunities for fellowship in the workplace! The irony here is that we've all met atheists who live more Christianly than some Christians we know. Maybe they too deal with hypocrisy; hypocritical atheists? (I'm being facetious). But double mindedness is nothing new. The prophet Zephaniah said that God would stretch out his hand against "those who bow down and swear by the Lord and who also swear by Molech." (Zephaniah 1:5). As an aside, for those who may not know who Molech was, he was a Canaanite god associated with child sacrifice. 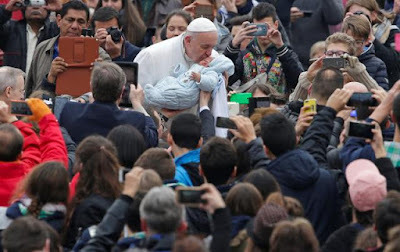 (Strange that the picture of the pope kissing a baby makes me think of Molech. Hmm; please don't read too much into that). Jesus himself said: "No servant can serve two masters. Either he will hate the one and love the other, or he will be devoted to the one and despise the other. You cannot serve both God and Money." (Luke 16:13). The Apostle Paul said it this way: "You cannot drink the cup of the Lord and the cup of demons too; you cannot have a part in both the Lord's table and the table of demons. Are we trying to arouse the Lord's jealousy? Are we stronger than he?" (1 Corinthians 10:21-22). James calls the double-minded individual "unstable." (James 1:8). How many of us are "unstable?" Hmm, I wonder. I'm not Catholic and I've long since stopped labelling myself an Evangelical. And while I've never recognized the authority of the pope or the Roman Catholic Church, perhaps this one time I do agree with him. Regardless whether we're Catholics, Evangelicals, or whatever other handle we might prefer to use to describe ourselves, who are we kidding with our duplicity? God's not fooled. We haven't pulled the wool over his eyes. If you want to be a Catholic, then be one. If you want to be an Evangelical, then be one. But don't just be half a Catholic, or half an Evangelical, or half a something else. That's not just hypocrisy; it's nauseating! The risen Christ had another thing to say concerning nauseous double-mindedness in the church. He said, "I know your deeds, that you are neither cold nor hot. I wish you were either one or the other! So, because you are lukewarm - neither hot nor cold - I am about to spit you out of my mouth." (Revelation 3: 15-16). Stop and let that image sink in for a moment. Imagine being spit out of the mouth of the Lord, just as if he had bitten into a rotten worm-infested apple. Hypocrisy, double-mindedness, lukewarmness; all part of the same coin. Maybe the pope is on to something here. Maybe being an atheist is better than play acting with our faith. It just might be that the best indication that Pope Francis is the right man to lead the Catholic church is the number of Protestants who agree with him... myself included.